Midwest mariachi music at its finest with traditional mexican folk music, as well as pieces from Venezuela, Puerto Rico and our home state of Oklahoma! After being together for over 9 years, Mariachi Orgullo de América is proud to announce the realization of their first album entitled, "Oklahoma's Mariachi," which include many great classic songs as well as the recognizable Mariachi Orgullo intro to Guadalajara and their own cover of the Oklahoma state song! "This CD is the culmination of almost a decade of development for our group," beemed Mariachi Orgullo director, Robert Ruiz. "We are at a point now where we are really focused on the development of our career as one of the leading mariachi's in the Midwest, and launching this CD is just the first step of many we plan to take over the next year to take our music project to the next level." Performing at over 100 presentations every year, Mariachi Orgullo is no stranger to the spotlight, but this group can now join the ranks of many other recording artists that are doing their part to keep Mexican culture alive and thriving. Apart from the requisite tribute to the long mariachi tradition that has proceeded them, "Oklahoma's Mariachi" also includes non-traditional pieces such as the group's tribute to Puerto Rico in En Mi Viejo San Juan, as well as the Venezuelan favorite, Caballo Viejo. Another non-traditional is the cumbia favorite, Sergio el Bailador. Other tracks include Hermoso Cariño, Caminos de Guanajuato, Jesusita en Chihuahua, La Malagueña, Libro Abierto, De Que Manera Te Olvido, Caminos de Michoacan, Amorcito Corazón and crowd favorites Viva Mexico and Volver, Volver. "All of these songs were truly a great pleasure to record, and we are anxious to begin our next project which will include some original songs as well songs that have really help us to make our mark in the hearts of all of the great people who have supported us through the years," related Mr. Ruiz. 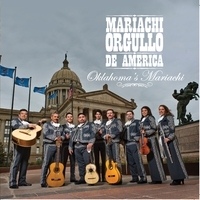 "Oklahoma's Mariachi" will be released in November of 2011, and will be available online and at Mariachi Orgullo de América performances.